Dog-friendly, dog-safe communities for all New Yorkers. New York, NY, June 25, 2010 - The Dog Federation of New York (DFNY), a statewide coalition of dog owners and dog-related organizations, today voiced grave concern over a local ordinance approved by the Village of Rockville Center Board of Trustees that places restrictions on responsible and caring dog owners, disregards New York State law and raises civil rights issues. Elected officials in Rockville Center, New York recently approved Local Law 9, which prohibits ownership of Rottweilers and “pit bulls” in direct violation of the long-standing New York state law that protects residents from negative stereotyping and breed discrimination. Rockville Center’s new local law bans ownership of dogs based solely on the dog’s physical appearance and interferes with their owners’ right to be heard by a judge. 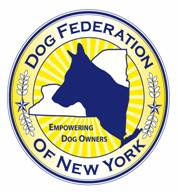 Through its attorney, the Dog Federation of New York sent a letter to the Village Board of Trustees urging officials to immediately repeal Local Law 9 and reminding them that an illegal breed specific law would face challenges in court. Rockville Center residents who fear they will be negatively impacted by the ordinance should contact DFNY as soon as possible. Looking for info on the Suffolk County Pet Store Ban? Mission Statement: To safeguard the common interests of all dog owners, including the protection of the rights of responsible dog owners, and the promotion of reasonable and humane animal control laws. To develop and engage in programs to educate elected officials, as well as the general public, on canine legislative proposals in order to preserve our special relationships with our dogs. The Dog Federation of New York is a not-for-profit corporation, registered in the State of New York. Become a corporate sponsor or make a donation! DFNY does not condone any form of animal abuse, including inhumane tethering. Proper tethering is a responsible, humane form of restraint which safeguards both the dog and the community. Caring owners must exercise caution and adequate supervision of their dogs, regardless of the restraint method they choose to employ. D F N Y Links! DFNY Dog Law -- E-list for discussion of dog and pet-related laws and legislation in New York -- everyone is welcome! Do you know how your NYS representatives stand on dog-related issues like insurance discrimination, pet limit laws, and size and weight restrictions? Searching for info on New York dog laws? We've got the answers at New York Dog Law! Guidelines for the Off-leash Community DFNY offers Guidelines for a Responsible Off-leash Community to off-leash dog area enthusiasts.